“Letters from the Dead” by Dawn Meredith is a highly entertaining, fast-paced suspense novel featuring Delia Fox, a young adult with a unique ability. Delia is just your normal every day University student, until an accident at the café where she works changes her life forever. Chaos ensues when an explosion occurs in the backroom of Iggie’s Café, and when a young man perishes in Delia’s arms as they try to escape the danger, she realizes she can read his memories. As Delia begins picking up the pieces of her life, she finds work at another café and is hired on as a consultant for the Wintering Police Force where she teams up with Inspector Jonah Rainbird, using her gift to solve local murders. Not everyone appreciates Delia’s gift however. With the exception of Inspector Rainbird and Sergeant Blake, the cops despise her and consider her a meddler who just gets in the way of their work. In addition, a local crime boss is after her head, her ex-boyfriend is a constant source of trouble – even her parents think she is consorting with the devil. Still, Delia believes strongly in her work and will do whatever she can to gain justice for the deceased. “Letters from the Dead” was such a fun read that I would classify as a cozy suspense novel spiced with romance, drama, and coming-of-age elements. While there are certainly a few antagonists adding to the overall drama, the story revolves mainly around Delia and her gift with several subplots to keep the tension building and the pages turning. I could easily picture the various settings, from the crime scenes and surroundings, to the neighborhood gardens and public parks. The writing is crisp, with enough particulars to create vivid pictures without overwhelming the reader with elaborately overdramatic details. I totally enjoyed the characters in Meredith’s story as well. Delia is an authentic coming of age heroine and I could feel exactly what she went through at all times in the story. From her frustration with Rainbird as she tries to draw him close, the tension she endures when dealing with her overprotective parents and her complete exasperation with her ex-boyfriend as he continues to meddle in her life, Delia is a quirky, yet endearing character readers will easily relate to. Rainbird as the lead male protagonist is quiet and unassuming and completely loyal to those he holds dear. I was as frustrated as Delia at times with his behavior and stunned to find out his secret – a secret that changes the entire course of the story. Kudos to Meredith for a plot twist readers will not see coming and for taking that twist down yet another entirely unexpected avenue. 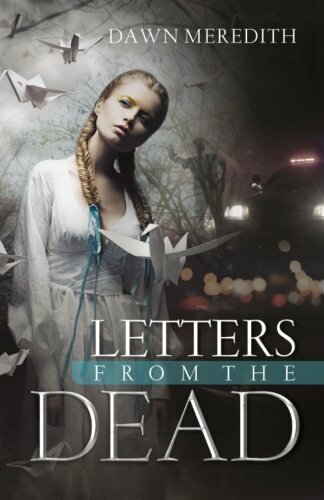 Overall, I thoroughly enjoyed “Letters from the Dead” by Dawn Meredith and highly recommend it to adults and young adults alike as an entertaining, engaging read.